Optimized Chromium with Crominex 3+ is a micronutrient supporting normal glucose metabolism. Optimized Chromium with Crominex 3+ is recommended for those supporting normal lipid and triglyceride levels. 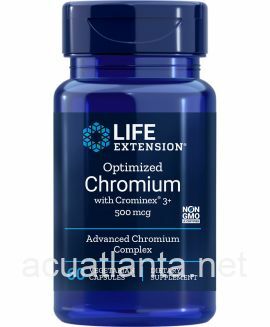 Life Extension Optimized Chromium with Crominex 3+ is an advanced chromium complex supporting normal glucose metabolism. Chromium is a critical micronutrient recognized for its important role in supporting normal glucose metabolism. This most advanced chromium complex has been developed with a standardized extract of Indian gooseberry and a proprietary form of the adaptogen shilajit. Crominex 3+ helps support normal cellular glucose absorption, normal endothelial function, normal lipid and triglyceride levels and normal cellular energy production. As a dietary supplement, take one (1) capsule daily with or without food, or as recommended by a healthcare practitioner. Optimized Chromium with Crominex 3+ product is available only from licensed healthcare professionals. Buy Optimized Chromium with Crominex 3+Online here at AcuAtlanta.net or our clinic.